From time to time I have discussed personal fabrication, including one of the most exciting features which is the direct sharing of knowledge: not just instructions or plans, but actual executable digital designs that can be built or modified by anyone. Once these designs make the move to digital–as they did a long time ago–they can be “Web-ized”: people can upload designs, share them, search for them, remix them, buy and sell — the works. With the availability of inexpensive fabrication machinery using widely available standards, the way is clear for the full-on web of “making”. Importantly, digital designs can be used to make products at home, in a community workshop of makers, fab lab, or public library, or in a factory of any size. This “maker’s web” is just emerging now, as we figure out the best ways to share and sell designs. It is easy to say, “let’s share my design”, it is not as easy to know what data is needed, how to make it available, how to search designs (they are semantically complex and do not necessarily have any easily parsed text), and how to deal with property rights. Taking a song from the Open Source Software movement, others have launched efforts to create “Open Source Hardware“, “Open Source Ecology” (as in technological ecology), and even “Global Village Construction Kit“. I’m not likely to need, say, and Aluminum extractor (see the Global Village Construction Kit), but it is interesting to know that the plans are available for free. These “open source” initiatives are somewhat romantic in their goals and scope: everyone should have the ability to build “civilization” from the ground up. Well, many of us haven’t got the time, skill, or energy to build everything ourselves (even if we might want to). Naturally, openly shared knowhow also lends itself to commerce, small and large. Just as craftworkers have always shared skills and designs, businesses can use openly available knowledge to serve local or global markets, providing skill, customization, and style to the basic designs. The Internet already provides many of the tools for marketing and selling, including payment systems and stores such as Etsy. Obrary is a relatively new effort aims to tie together high quality “Open Design” in a way that welcomes commercial uses. This company uses the term “Open Source Design” rather than something like “Open Source Hardware”, emphasizing the crucial digitally represented knowledge as the product. The designs are all available under Creative Commons licenses (popular with artists and used by this author on occasion). It is quite noticeable that most items are also for sale: someone, somewhere in the world is ready to build it and send it to you. Or, you can try to make it yourself. Or you can take the plans and modify them to your own needs and wishes. From Obrary: The Warré hive design was originally developed by the French Beekeeper Abbé Émil Warré, and published in 1948 in his book ‘Beekeeping For All’. 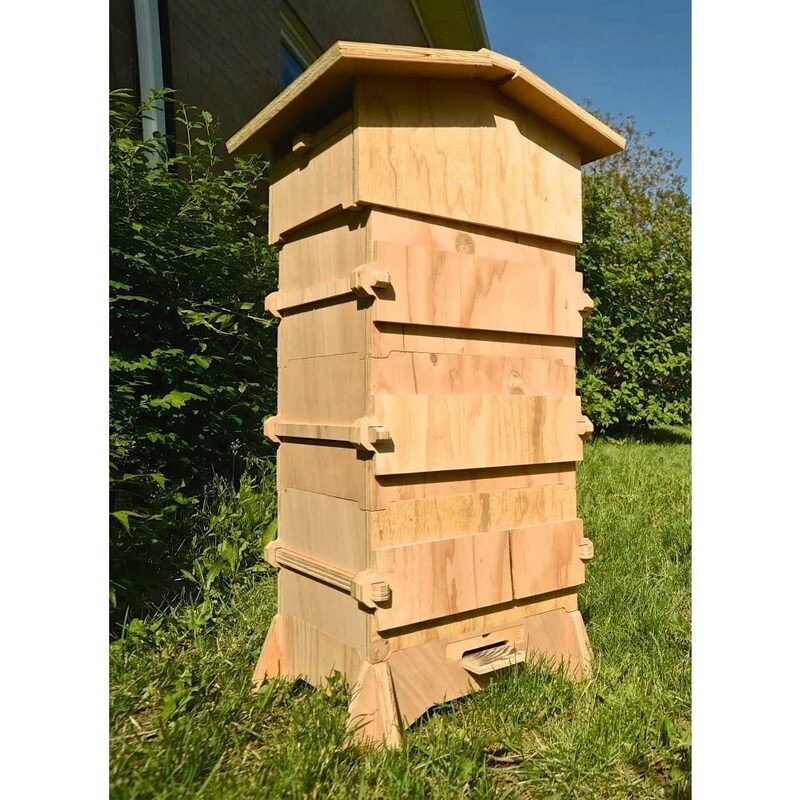 Warré named the hive the ‘Peoples Hive’ and designed it for ease of use and for amateur Beekeepers. This modern iteration was created and tested at Valldaura Labs and Fab Lab Barcelona together with the Open Tech Collaborative in Denver Colorado. For example, I found a cool looking beehive offered by the Barcelona Fab Lab (not that I have anyplace to put it). I can also get the plans to make it with a CNC router. Downloads are awkward today, but soon it will be more of a ‘click here’ interface. In this case, the download includes a detailed manual, drawings in STL format, and CAD files in 3DM and DXF. With these files and proper software (available, for instance, at a local Fab Lab) I can examine the design, fiddle with it, and make my own version. This array of files reflects Obrary’s stated philosophy that it is important to provide the actual CAD files, not just a portable format such as STL. Some of these files may not be useful without expensive, definitely-not-open, software. However, there is much information in the files that may or may not be faithfully maintained when the design is “exported” to a portable format, or may be lost when the design is “imported” into other software. I sympathize with this approach. it is not perfect, because some people may have difficulty using all the files. But it can be very difficult to transfer complex designs between software systems, and it can be hard to even know how to do it. It is better to document what was really done than lose information that may be hard to get out of a particular software tool. All this is very interesting. Not every product in Obrary will be as well documented as this one. It is hard work to create manuals and instructions, and some people will not have the time or ability to devote. But Obrary will probably have discussion forums soon, and popular designs will attract communities of interest who can contribute and improve the designs and the shared knowledge in the plans and instructions. Suggested Feature: One thing I would really like in a service like this would be some way to find local workers who will build. For example, if I need beehives, and I find a design I like at Obrary, and I want to buy one or more. It would be nice to have a way to find one or more people in my town with the skills and tools, and pay them to do the build. In this case, there might reasonably be a “suggest donation” back to the designers, but most of the money would be in my local economy, supporting families where I live. This can be done informally, and I’m sure it will. But is there a role for something like Obrary in this process? And if so, how should it be done? Scott Austin, co-founder of Obrary, here. Thanks for taking the time to write about our service Robert. I like your suggestions about finding local makers and donating to designers. We’ve added these ideas to our backlog.